Let's go make some fantastic Vegan Baked Beans! Wash the beans well, sorting them for poor quality (discoloured, etc) beans and foreign matter. Soak dried beans in clear, cool water mixed with 1/4 txp baking soda (water should be about 2+ inches [5+ cm] over the beans) for about 5 hours. Drain the beans of liquid and rinse them again. add in and fry, lightly, 1 dried, red chili pepper, 2 bay leaves, 1 1/2" (4 cm) cinnamon stick, diced celery, basil, oregano, and (optionally) about 10 whole pepper corns. add ground pepper and cumin and stir in. Add drained beans, stir and fry lightly. Add 5 cups diced tomatoes and stir in. Add 1/2 cup water (use less water if your tomatoes are very watery). Add 1 Tbsp white vinegar. Cover beans with vegetable juice. Add 1 Tbsp maple syrup and stir in well (or your prefered sweetener - molasses is traditional in Boston Baked beans. We prefer the flavour of maple syrup - more traditional in Maine, U.S.A. or Quebec, Canada). Stir in reserved celery leaves and 1 heaping Tbsp dried or minced parsley. Once boiling, move to the oven to bake - checking periodically to stir and add vegetable juice and/or water as needed. When cooked so that the beans are tender to your liking, take them from the oven and add about 1/2 tsp salt. Stir well and add additional salt carefully - keeping in mind that as the beans sit, the flavours (including the salt) will change and may intensify a little. Under-cook the beans only a little - they will soften, still, as you reheat them. Add only a Tablespoon of sweetener initially, Over-sweetened baked beans cannot be unsweetened. Add salt only after cooking - at the end of the baking process. Taste carefully - not adding enough water will make the taste too pungent while too much will cause it to taste thin. Baked beans get most of their colour, not while cooking, rather, while sitting over night. They will aquire that wonderful orange-brown color you know on the second day - but don't worry - they're always delicious regardless of colour. So much can be said about baked beans. This dish has a history of hundreds of years. 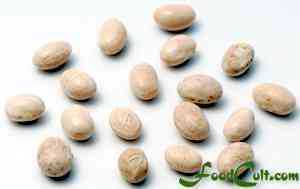 It is typically prepared with a bean native to North America - the "navy bean", also known as "haricot bean". While navy beans are most common, we have tried preparing them with pea beans and black eyed peas. They're best with navy beans (but go ahead and try everything you wish - you'll learn your own favourites)! This recipe is not for Boston baked beans. Boston baked beans are prepared with pork. This is a vegan recipe and, so, is adaptable at any given sitting - to the vegan, vegetarian or the meat-eater's plate by the simple addition of cheese for a vegetarian who prefers this (we like a firm cheese that only partially melts such as a diced, medium gouda or emental) or sliced sausage for the person who must have meat. Still, served up with no additions, this is a fantastically healthy, fun and satisfying vegan dish! 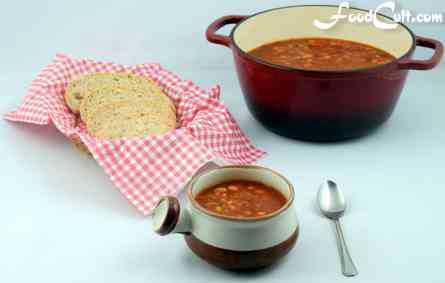 Baked beans are also perfect as a side dish to almost any meal. We enjoy, on occasion, beans and eggs; or beans, sausages and eggs ... or steak 'n eggs and beans or, as the English like it, beans on toast. Of course, one of our absolute favourite ways to enjoy beans is the Baked Bean Pizza! We, here, find plain beans best with fresh, home made pita, french bread; a deep-crusted, chewy Calabrese bread ... or even a basic, Italian white bread is wonderful with beans - but you will find (if you don't already know) your own favorite way. Beans, beans they are good for your heart. The more you sit on the toilet seat! They make you strong and make you fart. Which gives the body ease. So lift your leg and let it squeal!